May 21, 2015 - Allegiant Air has been approved by the Federal Aviation Administration to continue its trajectory of record growth. 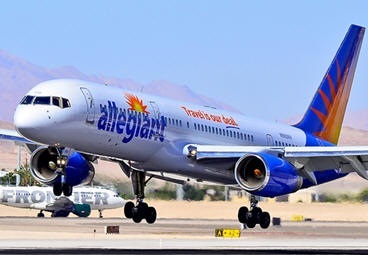 Following a brief period of heightened surveillance due to labor negotiations, the FAA has found no cause for limiting Allegiant's growth and has approved the addition of planned new routes and airports to the company's scheduled service. "The safety of our passengers, crew, and employees is always our first priority at Allegiant. We were confident that our operation could withstand any level of scrutiny, and we are pleased to be able to continue with our planned growth," said Steve Harfst, the company's chief operating officer. Allegiant disclosed in its first quarter 2015 earnings public filing that the local FAA office issued a notice indicating the carrier would be under heightened surveillance as a result of what the FAA referred to as "labor unrest" and that due to the workload of reviewing its nationwide surveillance, the FAA would be discontinuing further approvals for new aircraft and cities to be added to Allegiant's operating certificate. This decision by the FAA removes all restrictions to Allegiant's future growth and allows the FAA to return to normal oversight activities. Allegiant, having initiated service from Raleigh-Durham, N.C. on May 6, 2015, is set to add new scheduled service from Akron / Canton, Ohio to Savannah / Hilton Head, S.C. and St. Pete-Clearwater, Fla. on Thursday, May 21. Additionally, service from Memphis to Las Vegas, Orlando and Fort Lauderdale will begin on the same day. 11 new routes will be added over the coming weeks. Las Vegas-based Allegiant Travel Company is focused on linking travelers in small cities to world-class leisure destinations. The company operates a low-cost, high-efficiency, all-jet passenger airline through its subsidiary, Allegiant Air, while also offering other travel-related products such as hotel rooms, rental cars, and attraction tickets. New Partner Or Threat In The Sky?